Ther. 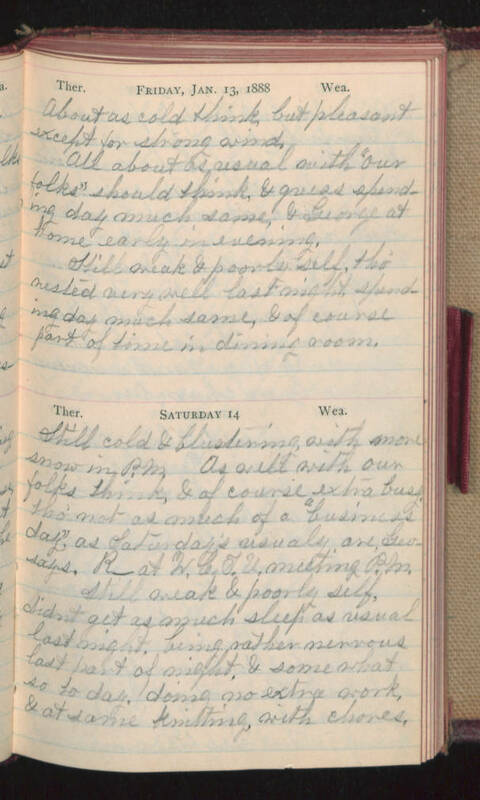 Friday, Jan. 13, 1888 Wea. About as cold think, but pleasant except for strong wind. All about as usual with "our folks" should think, & guess spending day much same, & George at home early in evening. Still weak & poorly self, tho' rested very well last night spending day much same, & of course part of time in dining room. Ther. Saturday 14 Wea. Still cold & blustering with more snow in P.M. As well with our folks think, & of course extra busy tho' not as much of a "business day" as Saturday's usualy are, Geo. says R_ at W.C.T.U. meeting P.M. Still weak & poorly self, didn't get as much sleep as usual last night, being rather nervous last part of night, & somewhat so today, doing no extra work, & at same knitting with chores.